The boilersuit – Practical and pragmatic posts. No guarantees, though. There be two Twitch streamers out there that have provided me with a sizeable number of hours entertainment. The first one, who I stumbled across four or five years ago, who not only has my sense of humor, he’s also an Australian that is damn good at playing video games (most notably Dark Souls)! Why him, specifically, then? He’s a great entertainer in that he talks tons while playing games, and the sarcirony is huge with this one. So, go and say hi to Letofski. Channel rules are stupid. Don’t do dumb things and we’ll be fine. The “we get to share data with our partners” nonsense need to stop. Even if you don’t use facebook, if you use these apps for tracking your periods, your heartbeat or buying a house, that data is shared with Facebook. I’m not oblivious or ignorant as to why partners are there in the first place. I’m also not a believer in that all partnerships are bad. I am, however, highly critical of the lack of transparency that comes along with the “partner package”. I have and am developing apps and services myself, so I know of this area, and that everything isn’t always clear cut. As a developer and maker of things, you often want users to become aware of and engage with your services, and a partnership can be an efficient way to reach that. But it’s up to you to vet and decide which ones you part we with. And that’s on you! Noone else can be blamed for your choice of partners; not your partners, not your users, not the store you publish your things on. Just you. Now, with that out of the way, let’s say you found a partner that you want to collaborate with. Maybe you should ask them if you’re allowed to disclose who they are? And what they do? And how they provide benefits to you and/or your users? If they say no, then maybe you should reconsider? I mean, you’d rather want your users to feel even more confident in that you’re not abusing them, right? So why not go the extra mile in securing that? Disclosure can be good and bad. But in this case I can’t see a reason for why it would be the latter. I’d rather we, the makers, reach a disclosure best practice ourselves, rather than legislation thereof. It was a sad day when the need for GDPR arose and reached the point of having to be enforced, and I’d rather we avoid those situations in the future. I’m ok with it being enforced, though, if it comes to that. Hey, whaddya know. Finally some user selectable icon shaping! Posted byoverseer February 21, 2019 Posted inScrapheapLeave a comment on Google Home icon shapes! Here we go again; another day, another data breach. This time it’s the photography centric website of 500px. To be honest, I haven’t used it for anything since I first created my account, as I’ve many years ago come to terms with the fact that I want to keep moments, not 100gb a piece gargantuan sweeping electron microscope catalogs of pictures. And today I got another reason for quitting it altogether. So, why not just delete the account while we’re at it, right? But. What’s this? On the accounts page (that is horribly bad for mobile browsing), there’s a red button labelled “Deactivate account”. Not “Delete”. Not “Terminate”. Not “You’re not quitting, you’re fired!”. It says “Deactivate account”. So, what could this possibly mean? That it’ll get deleted after a grace period (you know, like the email newsletter unsubscribe pages where they asked you if you made a mistake. Yeah, I did make a mistake, by allowing you to contact me to begin with)? That it’s being cleansed of all data but the unique ID for posterity? That my account will not be used to run any more botnets? I don’t know. Because it’s not saying anything else. Just “Deactivate account”. It’s so mysterious. Like it wants me to ask it so many questions; “What will happen now?”. “Are we good?”. “Will you release the hounds?”. “Say something more (YOU IDIOT), button”. Maybe I should feel like I’m not really in charge of my account? I mean, it’s not stored on my computer, now is it? Or maybe, just maybe the asshat owners of these account harvesting websites could just tell me, up front why the actual frood they’re holding my account hostage!? And I’m not talking about some arbitrary reason like there being financial information stored that has to be kept. Because if I not even once made a monetary transaction or provided any payment details, there’s nothing that had to be kept. If I can only make one individual out there become more aware of their digital footprint and that there’s actual implications and repercussions of registering to websites in this day and age, as well as making use of more disposable details (emails, name, the lots) whenever possible, this blog will have provided a value. And 500px. If you’re listening; Stop it. I’m sure you have good intentions. But You’re helping no-one but yourselves in so many ways with this. How is not being able to fully remove an account helping your users? Because I assume it’s them you’re wanting to keep by not allowing them to leave cater to? I don’t know the value of this service yet, I haven’t used it, but I do find it a bit intriguing because it’s open source and may be a de-Googling tool for the future. This “toot” by one of the, if I understand this, (previous or current) consumers of the ActivityPub specification, shares a thought and most importantly a link to a post made by another, presumably, consumer. In brief, there seem to be a quite some zealotting, passion, discussion, ignorance, considering, etc, about how to best create the spec for ActivityPub. It’s an interesting read, to see an article written by a critic of where ActivityPub as a body have headed for, for at least the last passing year. If things are, even only roughly, as (I’ll call him) “schub” describes, it sounds like the people who are mainly sailing the ActivityPub ship, needs to take an introspective look at who they’re making it for. In this day and age of literally multithousands of (mostly bad) APIs around the Internet of memes, I thought we had come to a collective point that APIs and specs are made for the individuals wanting to make a real use of it. The entity providing the spec has the sole responsibility of providing the rules of engagement as a guide and constraint to the implementer. Having a stance saying “you should (need) to talk to other implementers to get things straightened out in terms of interoperability” and the spec doesn’t state a bare minimum of constraints…… Just… Ugh…. I’m not envying anyone trying/wanting/being ordered to implement anything. I since a month or so have this HP 830 G5 EliteBook. Before this I had a MacBook Pro 13″ 2013. The way I sometimes utilised the MacBook was to watch video while travelling together with others. And because it’s boring to watch alone I used this handy dandy 3.5 mm audio splitter to allow for the others to listen in on the same thing. Worked perfectly fine, if you can see through the occasional bickering about what volume level was appropriate. Now, back to the EliteBook. If we compare this evidence photo to the one at the start of this post, you’ll notice something a bit odd. The first one has my trusted Apple in ear headset plugged in. The other, the handy dandy audio splitter. But. What’s that…? The headset seem to be snuggly huggling the computer case. But the splitter doesn’t seem to fit the same way, now does it? And you’re right. The audio splitter doesn’t fit the same way. And believe you me, I have done a lot to see if I could force convince the thing to fit properly. It absolutely refuses. I’m denied of mine and my others group entertainment sessions. I’ve heard grim tales of 3.5 mm jacks being removed from phones. But I’ve never heard of a 3.5 mm jack refusing to have it plugged by a 3.5 mm equivalent plug! How am I supposed to be able to acquire a splitter that fits to this monstrosity when there’s literally no way to search for a product based on “a 3.5 mm audio splitter that fits in a 3.5 mm jack”!? Found this on Boing Boing. 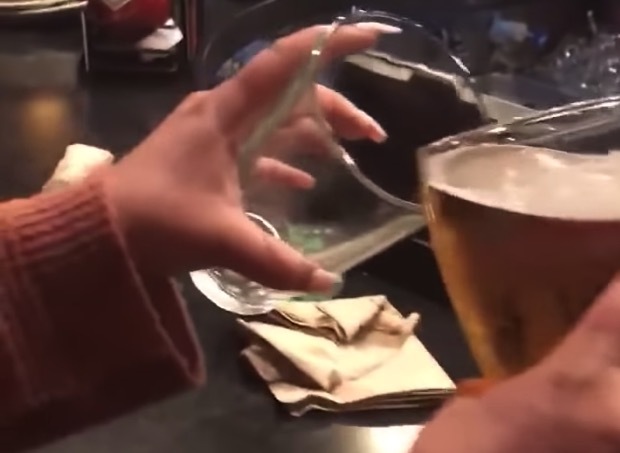 What’s the difference between a small and large beer at Applebee’s?